Home Zoysia is exceptionally hardy and tolerates high temperatures well. Its light-to-medium green leaves vary from fine to coarse. With deep watering, Home Zoysia will form a lawn that is so dense that it is resistant to weeds. If you’d rather host more outdoor BBQs than spend a lot of time mowing and edging, you may prefer this slower growing turf variety. Home Zoysia withstands heavy traffic, and is known for having the best wear resistance of any turf. Play Bermuda has soft, yet resilient deep-green leaves. It forms a dense low-growing lawn that is exceptionally tolerant to traffic. 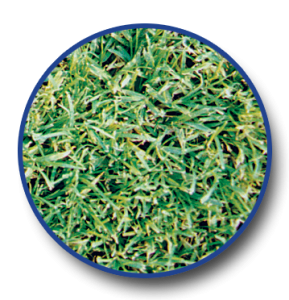 Because it recovers quickly, it is considered an ideal turf for active families with children and pets. Extremely heat- and drought-tolerant, Play Bermuda thrives on sunshine. It does not do as well in shady areas. Play Bermuda is relatively slow growing and has minimal thatch build up, so you might never need to have it dethatched.